While women make up about half the workforce, they remain underrepresented in boardrooms and C-Suites. This despite the fact that organizations with greater gender parity outperform others, and female leaders are better than their male counterparts at skills that can result in increased employee engagement and retention. 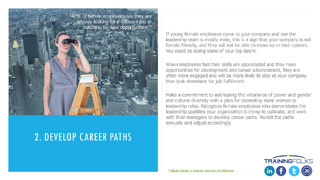 To improve your leadership development program to meet the needs of women employees with leadership potential, download Storming the C-Suite: Developing Your Female Leaders. The natural traits that make women successful leaders. Why organizations with mostly male leadership teams could be missing out on top talent. Simple organizational changes you can make to support potential leaders. Be sure to contact the corporate training experts at TrainingFolks for assistance in implement or updating your organization's leadership development program.